Spruce up your windows with a set of window treatments ! Are you looking for a way to spruce up your home? Have you given any thought of enhancing the appearance of your windows? Window treatments can be an excellent addition to your home. Not only can they provide your windows with a tremendous amount of character, but they can also offer a lot of functionality. Hunter Douglas offers an array of gorgeous windows treatments. Did you know that every window treatment from Hunter Douglas is covered by their lifetime limited warranty? 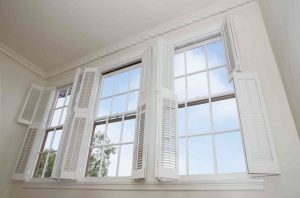 Keep reading and discover three window treatment options that you should consider for your home’s windows! Not only will these shades enhance the beauty of your windows, but they also provide energy efficiency. These shades can be used in both warm and cold climates. The honeycomb construction creates insulation by trapping air in pockets. As a result, your energy consumption should decrease, as well as your homes energy bills. These shades are available in a wide-range of styles. There are a variety of colors, fabrics, textures, and opacities. Hunter Douglas offers three different types of roman shades; vignette, solera, and design studio. The Vignette modern roman shades are an uncluttered option that does not have any exposed rear cords and have consistent folds. They are a low-maintenance option because they are a breeze to clean. The Solera Soft Shades are composed of a cellular construction. They are available in room darkening and light filtering options. Lastly, the Design Studio shades come in 4 traditional styles, which can be customized to your personal tastes. There are many benefits of the modern Roman Shades by Hunter Douglas. They will provide a home with a sharp and clean appearance. They feature child safety and do not have exposed rear cords. They are available in a wide variety of fold sizes and styles.